Fintech is booming in America, in Europe, in China and across the world with a record $57.9 billion raised during the first half of 2018 according to KPMG’s Pulse of Fintech report published today. London leads, with UK based fintechs raising $16 billion, more than all of USA combined for the first time ever. Europe as a whole has raised $26 billion across 198 deals. Asia follows with $16.8 billion in 162 deals. While in America Venture Capital (VC) investment is seeing new highs at $5 billion invested in Fintech with $14.8 billion invested in Americas over 504 deals, some 96% of it in USA. 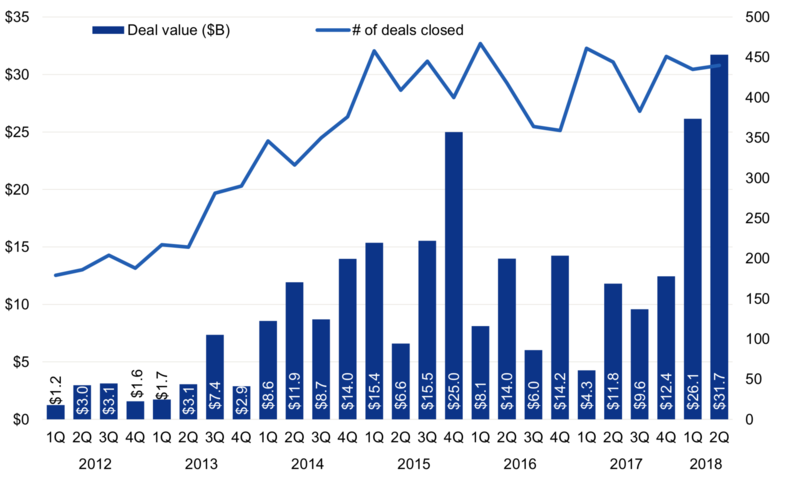 Fintech deals by quarter, 2012-2018. WorldPay’s acquisition in a $12.9 billion deal accounts for much of UK’s Fintech fund raising this year. While AntFinancial’s $14 billion Series C fundraising dwarfs all else in Asia. For America, outliers are less prominent, starting with a $3.5 billion buyout of Blackhawk Network Holdings. Top ten fintech deals for the first half of 2018. “Good sized funding rounds were seen during the first half of the year, including $100 million+ rounds to R3 and Circle Internet Finance in the US and $77 million to Ledger in France. In Europe, UK saw a record breaking first quarter with $13.1 billion raised. 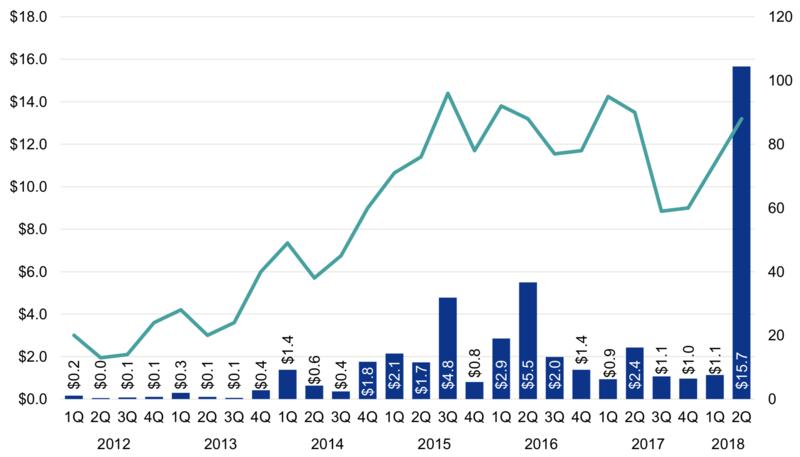 Even the second quarter’s $3 billion is the highest ever since 2012. Germany lags behind considerably, with just $300 million raised during the first half of 2018. While France is even lower at just $150 million, half of it from the hardware wallet Ledger. Denmark and Sweden, in contrast, saw nearly $10 billion raised in combination and even Russia’s Yandex.Market’s half a billion was higher than both France and Germany put together. Asia fintech deals in the first half of 2018. AntFinancial is a huge outlier, but China is clearly becoming a financial center to potentially rival London and New York. “Intriguingly, the trends for overall VC activity in fintech differ substantially from those seen across the venture landscape on the whole. By and large, angel and seed financing volumes have steadily declined for some time across the industry, while within fintech, such activity has only trended up and stayed steady for some time, albeit with some volatility. Overall, London’s early embrace of blockchain tech in 2014, when the then Chancellor even bought some bitcoins, has paid off and has paid off big. Germany and France, as we have long suspected and suggested in these pages, are failing to promote capital investment, although there are signs that is beginning to change at a regulatory level. China remains a force to be reckoned with, but their recent actions might risk a cool-down with u-turns, where cryptos are concerned, still no where in sight. Where ICOs are concerned, the report does mention EOS’ $4 billion raise, but does not show them in the top deals, suggesting ICOs are not accounted in this $60 billion record year for global fintech investments.